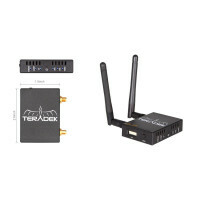 TERADEK CLIPLET Aerial Video Transmitter / Receiver Set - The Teradek Clip is the Worlds smallest and lightest H.264 transmitter developed specifically for unmanned aerial vehicles. Clip is a powerful HD video transmission solution for low latency monitoring (>4 frames) on iOS devices like the iPad over 2.4/5GHz WiFi. Clip has a micro HDMI input, dual SP-RMA jacks for high gain antennas, and can transmit up to 100m without a router (typically 60m real-life conditions). It weighs in at just 70g with dual aerials attached. The Clip is supplied with a mains adaptor for testing and setup but is designed to work with your UAV's own batteries.